The Jolly Librarian’s Advice to Graduates! Realize today that you are responsible for your own life. It is easy to blame others for the things that you didn’t get to do in life, but the time for blaming others is over. If you want to go to a private college and your parents can’t or won’t pay for it, then you have some choices. You get a loan and pay it off. You work for a while until you have the money. You go to a different, less-expensive college. All choices have benefits and costs. But whatever choice you make, it’s YOUR choice, so accept the consequences. In the long run, you’ll have a much happier life if you start realizing that you’re in control of it. Always carry a book with you. That way you are not forced to watch soap operas or talk shows when you’re waiting for your car to be fixed. There is some talk now about book reading being dead. I doubt it. It may just be returning to the old state of only the elite few being readers. I hope not, but if so, then make sure that you’re in that elite few. Never expect warm, fuzzy hugs from alligators. You can love an alligator; just don’t expect it to be a kitten. Don’t wait until you’re married to start your life. If you want to live in Wales, then go to Wales. If you want a house, then buy one. You’re more likely to find your dream person if you’re living your dream already. Never buy jeans one size too small in hopes that you’ll lose weight. Enough said. If someone tells you that you would be lovable if you lost five pounds, run. No matter what you do, those sorts of people will always find something wrong with you and never find you good enough. Love your job or find a new one. Most of us will spend more hours at work than anything else we do. There is not enough money in the world to make up for eight hours of misery five days a week. Do one kind thing everyday without expecting anything in return. It’s easy to perform acts of kindness when we know we’re going to get recognition or someone will reciprocate. It’s not so easy when there may be no acknowledgment or the recipient is not especially appreciative. But it’s those very acts that build up our character and make us kinder people. Always keep your inner child close to the surface. I don’ t mean “inner child” here as that creepy whiny, codependent, subconscious creature that keeps you from maintaining relationships. I mean your actual child-self. Don’t become old before your time. Don’t get rigid. Be willing to have fun, to look silly, to just play hooky every so often. Be the one who does the Hannah Montana dance with a four-year-old. Be the one who lets toddlers put on your make up. As you get older, don’t be one of those people who refuse to listen to new music or learn the newest technology. Be the grown-up kids want to be around because they recognize the kid in you. In short, to have a happy life, show up, be present, have fun, and be kind. Life Lessons from the Library: Listening is a Good Thing. Now if that’s what the student actually needs, we come off looking almost psychic and impressive. But if not, then the student is less impressed, even more so when we don’t listen for the answer but start telling him that the book is checked out already or where in the stacks it’s located. The latter has led to some misunderstandings and students feeling quite hostile at our lack of attention to their needs. And understandably so. Everyone likes to feel that he or she is being listened to. Of course, that’s easier to say in the abstract than at the end of the long day when you’re facing the 100th question. But it’s worth remembering that it’s not the 100th question for the asker, and to him/her, it may be the most important going on at the moment. So for those of us in the customer service business (which really is everyone since customer service is really just old-fashioned manners), here are some tips to help us remember to listen. Everyone likes to be listened to. Train yourself not to talk until the other person has finished. That’s often half the battle. The other half is to keep listening even after you’re sure you know what’s coming next. And the Golden Rule definitely applies here: Do you like to be interrupted when you’re talking or have other people assume they know what you want or need before you finish asking a question? Then don’t do it to others. Monday Motivator: Keep a List of Funny Things. Perhaps it was the end of a long weekend where I had been running to various events or running to buy things for those various events. Maybe it was just the logical consequence of sitting in the hot sun in a dress for two days in a row. Maybe it was just because I was hungry and a little dehydrated. But on the way home last night, I found myself feeling depressed, so much so that suddenly there was a tear running down my face. And just as smiling can make you feel happier, a tear can make you feel much sadder, so by the time I walked in my house, I was sure that nothing good was ever going to happen again. Now I’m not suggesting sit-coms as cures for severe depression or periods of mourning, but they can really help with the run-of-the-mill case of the blues. Laughing at anything even for a few seconds makes it a little easier to laugh again and to start feeling better. So my advice for this week is to make a list of things that make you laugh. And when the next case of the blues hits, look at that list and do one of those things. It’s much nicer than sitting and feeling sorry for yourself. But have the list ready because when you’re all sad and self-pitying, it’s hard to think of things that will cheer you up. For me, it is the funny television show, such as “The Office” or “My Name is Earl,” both which are in syndication so they are usually easy to find. Just thinking of some of those episodes can make me smile. Of course, it will be different for you. But go ahead and make that list. It’ll help the next time you need just a little cheering up! What Do We Do When the Students Are Gone? Occasionally a faculty friend of mine will ask, “What in the world do you have to do when we’re gone?” as if the entire world stops when faculty are not on campus. I suspect, in his case, his development was arrested at one of Piaget’s early stages where things that are out of sight simply do not exist. Actually many things go on in between semesters: shelving late books, cataloging new ones, getting the textbook shelves ready, and calling those folks who still have overdues. Sally, Emily, and Charles are not on contract until June 1. They are out of touch. I have heard that Emily is enjoying blueberry scones and is about to go on vacation (to Texas, I think). Sally is probably riding her bicycle through the streets of Mount Juliet picking up plastic bottles as she goes and maybe even planting trees. Charles went to Arizona for a graduation, and if he hasn’t been arrested for not having proper papers, should be back at Bodacious Books by now. Andrew is working with disability services, probably thinking about all the magazines he’ll have to check in when he returns. Probably not. Sandy is filing in the deepest, darkest part of Financial Aid. 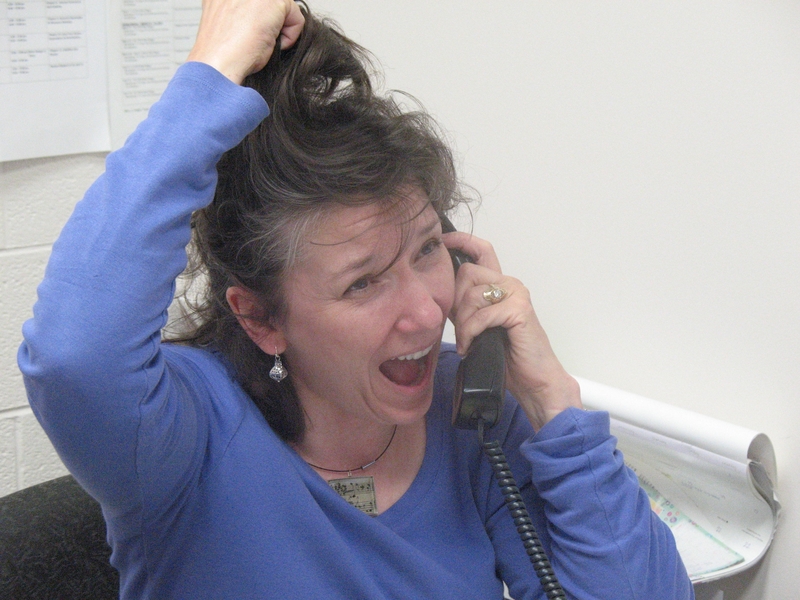 Pam is calling back the hundreds of messages that are left on Admissions phones each day. Faye and I have temporary offices in the Learning Center. Faye is working on getting our new Library System set up and ready to go. I am doing the various deany jobs that don’t always get done when students need our help. Oddly, I’ve also discovered that I miss my office, the physical space in the library that I call mine. I miss leafing through my books, trying to find a perfect quotation for something I’m about to send out. I miss my funny comics pasted up on the door. I miss my orchid and the mostly-dead plant that sits on the window sill. I’ve also discovered that most offices on campus do not keep as many available snacks around as the library does. I miss that too. In a couple of weeks, we’ll be back together again, and the students will return. I’ll be happy about both. And if you force me to admit it, I’ll be happy to see faculty as well. Student Worker Naomi is on break from school, of course. And she reports that things are fine, losing a pound or two each week. She also said that biking is helping, of course. Emily is also on break. Although she was enjoying a blueberry scone when she wrote me back, she also noted that she had actually lost weight while out and was back to her original weight when we started the group. Pam is working for admissions during the break, calling back all the students who have left messages about their applications. She thinks being busy in an office without a surplus of food around has helped, but she hasn’t checked her weight since she has trust issues with her scale at home. Today, I weighed the least I’ve weighed all month, although 2 pounds more than my low back in April. I too think it has helped to be out of the direct path of food. I eat lunch before I come in or bring lunch and then that’s it until dinner. I’ve also been able to exercise most days. I have found, though, that I am walking fewer total steps each day, mostly because it is such a pain to lock everything every time I leave my temporary office. So my post-semester analysis is this: The library losers seem to do better apart than together, and the library deserves its reputation as being a place where you gain weight once you’re hired there. We really should have seen it coming. The bottom two shelves of the bookcase for textbooks house the science texts, most of them extremely heavy tomes. Over the past two semesters, the upper shelf was beginning to bow from the weight. We even mentioned it several times. One library staff member would occasionally say, “That shelf is going to break under the weight of all those books.” But we didn’t know what else to do with them and didn’t think we had the time to look for other solutions. Besides, the bowing didn’t seem to be getting any worse. Maybe we could do on indefinitely with one misshapen shelf that still did the work. Then it happened during finals week. Fittingly, it was the Anatomy and Physiology text that broke the shelf’s back. There was a crack and then all the books tumbled onto the floor. We put them on a cart and are now in the process of looking for a new bookcase. It was a good life lesson. We simply can’t go on ignoring the stresses and pressures that are put upon us. We may think that we are doing a good job of handling them all; after all, we’re just suffering from the occasional headache or sleepless night. So we ignore the signs. But unless we do something, we will pay the price for the all the pressure we allow to be put on ourselves. And make no mistake. We do have some say-so in how much we take on. So don’t ignore the signs. Don’t be like our poor bookcase–broken down and waiting for maintenance to take it to the surplus room. Monday Motivator: You Never Know When the Last Impression Will Be. A television series I watch had its season finale this past week. Earlier, a character’s ex-wife was badly burned while cooking meth in her apartment. The character would not let his daughter see her mother to say goodbye, ostensibly because he didn’t want her to see her so badly disfigured but also because he was angry with his ex-wife for putting their daughter in danger. The daughter, not understanding any of this, only knew that she had not been allowed to see her mother. On the season finale, when the father was also about to die (the show’s budget must be really bad), he, having learned his lesson, had his daughter brought to the hospital so that he could say goodbye. For some reason this dovetailed with something a friend told me a few weeks ago. She had been in the grocery store and seen an acquaintance of ours. This man was apparently angry with his wife, so angry that he was loudly berating her in such a way that other customers were giving them the wide berth that the out of control are often given. It turns out it was the last impression she would have of him; he died a few weeks later. It reminded me that it’s only on television that people are given the chance to make that final impression. They get to apologize or say those final words of love and hope as the bullet wound becomes fatal. For most of us, I think things are much more random, and so it might be worth remembering that we never know when the angry, cutting, or cruelly sarcastic things that we don’t necessarily mean and certainly don’t mean beyond the moment may be the last thing someone will remember of us. Now I’m not advocating a sickly-sweet conversational style where all we ever do is say how much we love each other. Ugh. But what I am saying is that it might be worth it to take a second between the angry thought and its expression and deciding if it’s actually worth the impression it will make. Monday Motivator: Teach Your Children Well. This weekend, I went over to help clean up at a friend’s house that had been destroyed by the flood. My main way of helping had been babysitting, so this was the first day I saw the devastation. The entire street had most of the contents of their homes out on the side of the road to be picked up and carted away. It was a very sad sight. But while I was sweeping, a head appeared at the shell that used to be a window. It was that of a little boy. “Do you need water?” he asked and handed me a nice cold bottle. A minute later, his mom and sister appeared handing out sandwiches. This family was just a few of the volunteers who offered their help during this crisis. I was impressed by the number of volunteers, but even more so by the number of children and teenagers who were helping out. At the house next door, girls no older than thirteen or fourteen were leafing through the scrapbooks of an elderly woman, making sure that these documents of her life were salvageable. Younger children were handing out water and food. I was told that church youth groups had done some major manual labor at my friend’s house earlier in the week. There is something absolutely inspiring about children willing to pitch in and help people they don’t even know. And there is something inspiring about those parents who encouraged or permitted their children to help. Long after the houses are rebuilt and life has returned to normal, it is the memory of those volunteers that will define the flood of 2010. The Library Losers Take a Break–To Regain Momentum. Okay, the last week was not as bad as it could have been. As a group, we lost 2 pounds. But it was not a sterling week. Two of us discovered that the Nashville flood made us so nervous that all we did was eat. I actually gained 3 pounds in two days. I’m not very proud of this, since eating did nothing to allay my fear or to help those in need. Luckily, the semester is over and we are taking a break. The library is closed until June due to renovations, so the losers are separating for awhile. At least two of us plan to come back better than ever. In fact, I suspect, as library workers, we may actually be the types that do better on our own than in a group. So we’ll let you know how we did when we come back in June. As I write this, the toll keeps rising from the weekend’s floods. At least four colleagues have lost their homes and had to be rescued from rising waters. And then there are our colleagues whose family members also had to be evacuated and have lost their homes. Some are still hoping to hear from those missing. And some are safe in their homes, but the roads and bridges are such that they can’t leave their neighborhoods. As for the wider community, we are being told to conserve water. There is real damage to roads and bridges. The Opryland Hotel and the downtown have suffered real damage, striking a blow to our tourist industry and our economy. So there really can only be one Monday Motivator for this week. Reach out to those who are suffering from this disaster. On the news this weekend, a Red Cross representative said the best way to help at this point is to make a monetary donation, which makes sense. An easy way to make a donation is to text ‘REDCROSS’ to 90999 to donate $10 to disaster relief. Another great way to help is check the Hands on Nashville site; the Office of Emergency Management is coordinating the efforts here. Babysit a child so that they can meet with the insurance adjustor. Give a giftcard for the basics: underwear, toiletries, etc. A restaurant giftcard might be nice as well. Provide a listening ear or a hug.